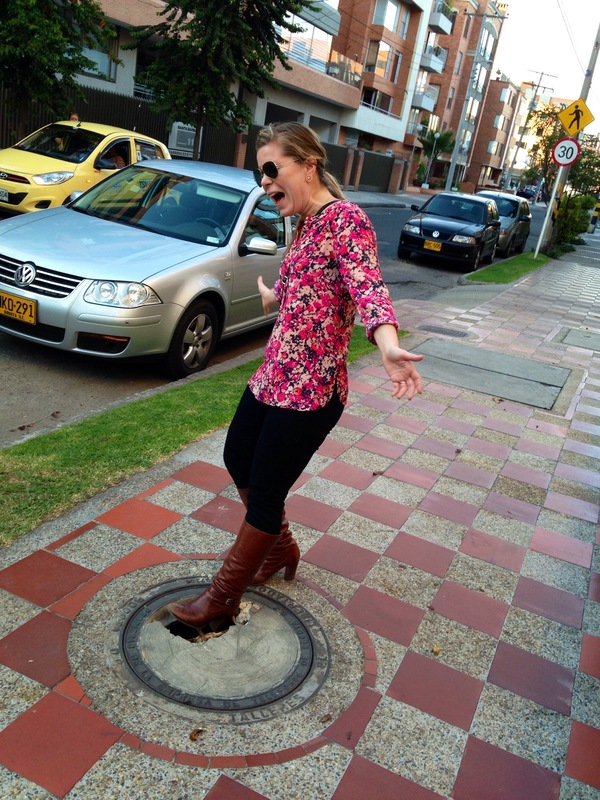 My sister pretending to fall in to a man hole. Yes, it’s fake, but in theory, it would be easy enough to get your shoe stuck or twist your ankle ! 1.) Lack of uniformity. I think the government probably isn’t in charge of sidewalks in this city because they vary from block to block. My poor grandma is in perpetual danger of sidewalk induced injury. In fact, I think she has actually had some pretty serious sidewalk falls. 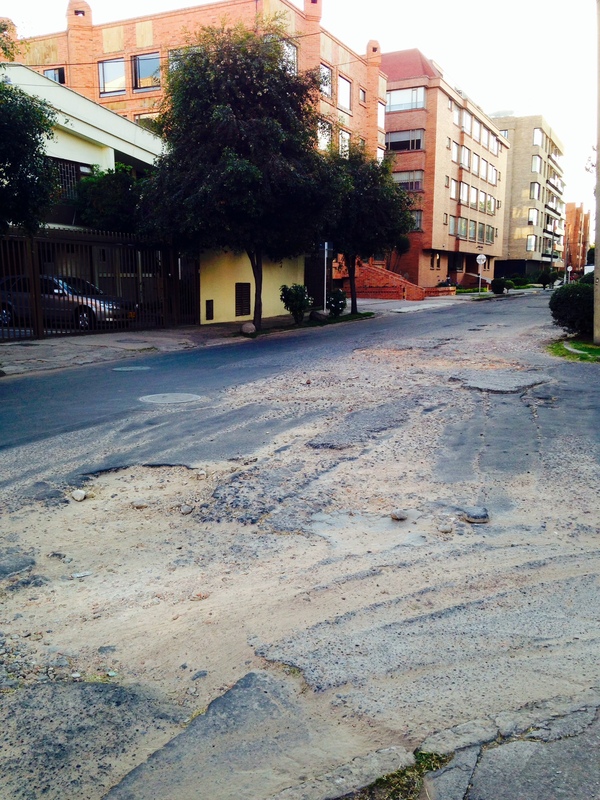 No, Bogotá sidewalks are not a friendly place for the elderly or clumsy. 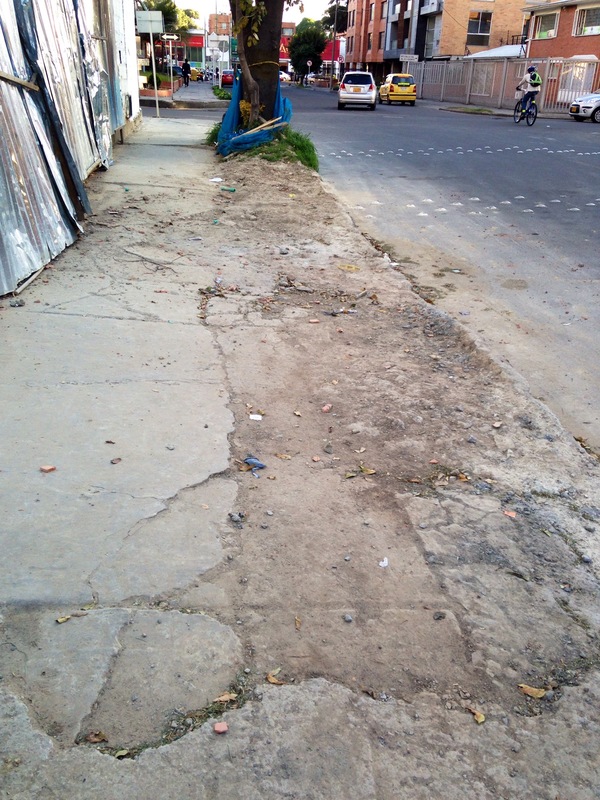 Or for the suburban foreigner used to uniform, even sidewalks. Yes, it’s true…if you don’t have a great sense of balance, Bogotá sidewalks can lead to some pretty embarrassing face plant moments. Kind of like that poor Austrian athlete who fell during the Olympic opening ceremony. 2.) They are crumbling. Literally. There you are, happily walking along a perfectly normal looking sidewalk, when all of a sudden, it becomes a sad-looking pile of gravel and dirt. And if they aren’t actually crumbling, you can expect lots of cracks, holes and elevated, loose bricks. It’s not a pretty picture out there. 3.) Sudden changes in elevation. This kind of goes along with the whole lack of uniformity complaint in point one. First, you are at street level. Then, they mix it up for you…it’s like the sidewalk mafia never wants you to look up. Without warning, the sidewalk is suddenly elevated to one foot. A block later, back to ground level you go. Then you’re at six inches. Then you’re at 18 inches. 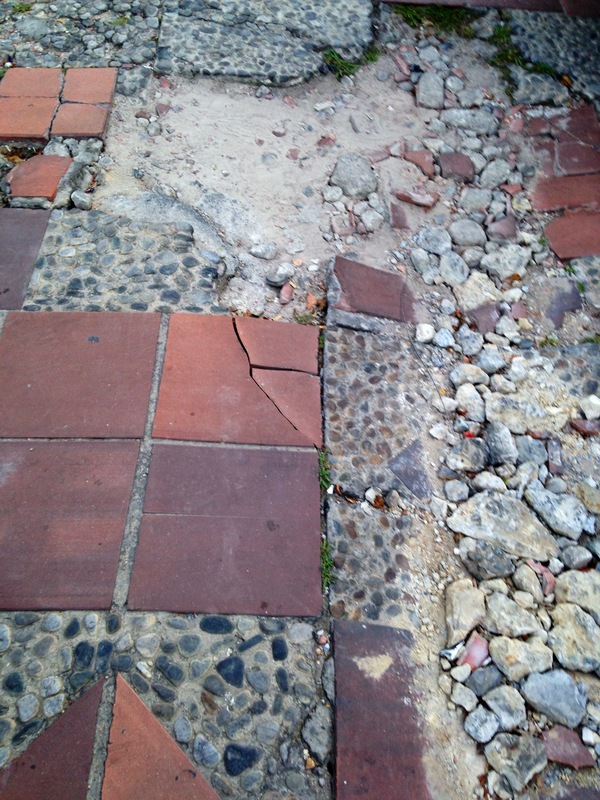 Then the sidewalk suddenly disappears and you find yourself walking on above mentioned pile of gravel. Then there is a 45 degree incline at a cross walk, which I think is supposed to be wheelchair friendly, but in reality, it’s probably more like a mini roller coaster for those getting around in a wheelchair. A little street by my grandma’s apartment. It’s like a meteor hit or something. How does this even happen? I really think the brick is made of children’s clay. Another example of bad sidewalks. Wow! The streets look pretty good, though. They are definitely worse in some countries! Please, don’t look for a silver lining! They’re atrocious, and that’s that. No other way to spin it. They were like that 48 years ago when I lived there. Some things spring eternal! They probably haven’t repaired them since 1966! Marilyn, I wish that was the case, but it seems like they “fix” them with some frequency…I think they just use really cheap materials that don’t last long! Welcome to my Blog/Bienvenido a mi Blog! Hi, and welcome to my blog! I'm a D.C area blogger trying to make peace with the D.C area lifestyle after spending a large part of my twenties living abroad. I'm not traveling the world anymore, but I try to do a lot of local exploration, hiking and traveling when I can. anomadlife on Christmas in Seattle. anomadlife on New Year’s Resolutions. Nora on New Year’s Resolutions. Rasha on Christmas in Seattle.